A Creationist audio guide to 100 of the most popular animals at your local zoo! Did you know that a polar bear can sniff out a seal under three feet of ice, ten football fields away? And how about the toucan: Can you explain how this bird uses its feather-like tongue to eat? 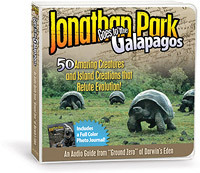 Join Jonathan Park and his father for a trip to the zoo as they explore these and other wonders of the animal kingdom. Featuring one hundred, two-minute segments, this creationist audio guide to a hundred zoo animals dispels common evolutionary myths and highlights some of the most fascinating attributes that God gave each creature He designed. Filled with engaging animal noises and amazing scientific tidbits, Dr. Kendall Park and Jonathan take listeners on a zoo journey to remember. Perfect for car rides or family zoo excursions, this audio presentation is a great tool for training your children about the wonderful animals of our world. Every creature has a story which gives glory to God. Learn about the rhinoceros hornbill, the komodo dragon, and much, much more! Each adventure is based on real places and scientific discoveries — all designed to build your faith! 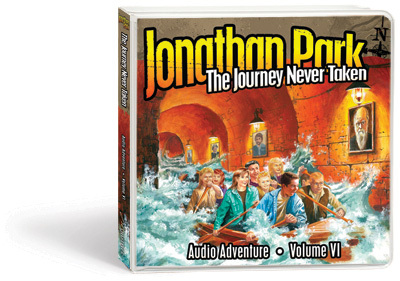 The adventures follow Jonathan Park, son of paleontologist, Dr. Kendall Park. The Jonathan Park project provides families and individuals with scientific evidence that is in harmony with the Word of God. It gives answers to tough questions that have caused many to leave the faith. Vision Forum and the Institute for Creation Research proudly present America’s only nationally syndicated creation radio drama, captivating listeners of all ages, and teaching the truth of biblical, six-day creation. Each adventure is based on real places and scientific discoveries! In Vol. 3, The Winds of Change — The best episodes yet! Join the families as they face a hurricane in Florida, travel to the Middle East to learn about the Tower of Babel, and form the Creation Response Team to help solve the disappearance of a well-known creationist. Join the Creation Response team on a remarkable world-wide adventure to recover the Beowulf manuscript, the oldest English writing ever discovered. Its ancient pages tell the exciting stories of man’s battles against fierce dragons . . .
On the heels of their worldwide hunt for the stolen Beowulf manuscript, Jonathan Park and the Creation Response Team have been challenged to a “Battle of the Worldviews” on national TV. Their competition is the Explorer’s Society, a group of evolutionary scientists who, since 1850, have been famous for their cutting-edge scientific discoveries. Learn to defend your faith while joining these two teams in their fight for survival. This year, as the world celebrates Charles Darwin’s 200th birthday and the 150th anniversary of Origin of the Species, use The Journey Never Taken to teach your family the real facts about Darwin, his mentors, and modern evolutionary science. Darwin, here we come! Take an exciting investigative journey with Jonathan and Dr. Kendall Park as they go to “ground zero” of evolutionism — the Galápagos Islands.